A guitar amplifier and mahogany electric guitar are displayed on a white background. Whether you are a professional musician or just enjoy playing guitar for fun, a guitar amp will enhance the sound of your electric guitar. Plug it in, turn it on, and listen to the sound of your guitar reverberate throughout the room. Whether you are playing with a group or by yourself, add to the fun of playing the electric guitar by using your guitar amplifier to create special effects. 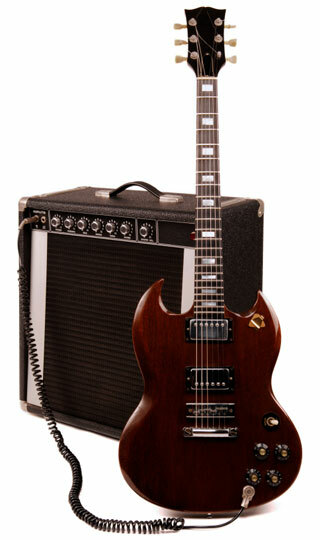 Use the search box on this page to find information about amplifiers and guitars.